This build thread will be based around our newly purchased 1971 Scout 800B(nick named Stumpy) and the many products that we offer and will be offering for the 1961-1971 Scout 80 & 800. It will also be a learning tool for our customers as some areas we will go into great detail as to what it takes to properly restore or modernize a Scout or make a proper repair. This will be an ongoing build and as we make improvements we will update this thread from time to time. In the past IH Parts America has mostly concentrated on the 72'-80' Scout II's and with all the parts requests we get daily for the older Scout 80/800 line it was time we start looking into offering new products that have been in demand. To do so we needed a test vehicle for research & development of new and existing products. Fortunately we were lucky enough to strike a deal with a fellow californian who had owned Stumpy for the past 16 years and was originally found out in the rust free mojave desert. Stumpy is a 1971 Scout 800B which is one of the last to roll off the assembly line before the Scout II became available. Stumpy is equipped with a rebuilt 304 with comp cam and Holley 500 cfm carb. Mated to the engine is a t90 three speed manual transmission and a single stick Dana 20 transfer case. Axles are geared at 3.73 with the rear being a trac-loc'd Dana 44 and a open differential Dana 30 front. Here's what we have planned for Stumpy thus far. We need to first go over Stumpy and make sure all existing parts are inspected and serviced as needed such as brakes, steering, lights, tune, etc so that Stumpy can immediately be driven safely. For planned modifications the rear axle will get a new Powr-Lok, CPT diffy covers for both axles, a mild lift kit, front disc brakes, power steering, nv4500 5 speed transmission and gauge panel. Now that you know a little about Stumpy here are some pictures to get you acquainted. First thing Stumpy needed was a bumper sticker so that passer-byes would be properly educated in the fact that they were in the presence of an official American icon. Stumpy has a factory spare tire carrier, an item we hope to offer in the very near future. The cargo bed is not all beat up. These are signs that so far Stumpy has led a good life and will continue to do so at our IH sanctuary. For the interior Stumpy was still sporting the original door panels. The vinyl floor mat is from another vehicle and doesn't fit quite right. This item will be replaced later. The dash trim proudly showing this Scout is a 800B, the last of its kind. Original steering wheel with the factory IH horn button. The original gauges are still in good condition with the exception of the temperature gauge which doesn't seem to work. Nice old school tachometer too. The driver door looks every bit as good as the passenger side. One thing that doesn't work is the window regulator. That will be dealt with at a later time. One way to tell that this Scout is a 800B is the lack of black paint around the headlight bezels. It's one of the few changes that IH made between a 1970 and a 1971. Getting under the hood things are pretty clean. Still even has the original emissions sticker. Here's Stumpy's rebuilt 304. The engine has a mild comp cam and a larger 500cfm carb. Still running a Holley points distributor. The cooling system has been slightly modified as it has a non-stock radiator and hoses. This will all be replaced. Just as the sticker says these last of the Scout 800's had a charcoal canister. A few things that I performed on the Scout before taking its first trip to town was greasing the chassis, checking the engine oil and coolant and checking all the lights. Since this stuff is so basic I'm just going to skip over most of it. Normally I would check the brakes too but I already knew there were issues there as the brake master cylinder rear reservoir was low and the fact that the Scout felt like it had no rear brakes when I took it on a test drive. With the measurements noted Stumpy was brought into the shop and racked. Due to the heavy front to back weight ratio a extra support was always in place under the front frame crossmember for extra safety. I figured the underside of the engine compartment wasn't going to be pretty as the engine has some oil leaks that will be dealt with at a later time. Although the parking brake was working well it was evident it could be made to work even better as evident with the kink in the brake cable. Note the extremely wet backing plate. When you see evidence of fluid leakage it can only be caused by one of two things, either a blown wheel cylinder or a leaking axle seal. See how dry the driver side is. I see some aftermarket spring bushings so the suspension has been serviced once before. The bumper brackets will definitely be dealt with at a later date but for now lets stick with the mechanics. The Dana 20 transfer case is relatively dry for being 40 years old. I wanted to note that the right rear had a lowering block in place just like the Scout II's. The driver side did not. Note the leaf springs are only a four leaf pack. First up was the brake inspection. The driver side looked real good. The passenger side was another story. Note that the top half of the shoe lining is missing and the blown out wheel cylinder. Pieces of shoe lining were all over the place. Amazingly enough the drum was still in good condition. From my past experience I knew that this Scout being a 1971 would have a trac-loc in it. Knowing what I know I figured this one would live up t its nickname as being a trash-loc or sometimes known as a crack-loc as I've seen many of these broken in half. Upon further inspection it was found that the center pin was well worn in the case a sure sign that this unit was done(and once removed upon further investigation I found the carrier was beginning to crack but could not get the cracks to show in the picture). And since axle work is somewhat voodoo to most people I decided to post some in depth pictures on how to replace your differential. In order to remove the carrier the axle shafts must first be removed. Usually I can pop them right out with a pry bar after removing the four retaining bolts but these were being stubborn so a slide hammer was deployed. With the shafts removed you can now see the inner seal and bearing race. Before removing the carrier its always a good idea to check the pattern and check the back lash. Before removing the bearing caps note the identifying letters on each cap. These letters are always present on Dana axles. The caps must be reinstalled in the same orientation as they were removed. On the driver side cap the letter 'g' is used and it is on its side. On the passenger side the letter is upside down. With the caps removed I like to remove the differential by using two heel bars on opposing ring gear bolts. By pulling evenly on the bars the differential will pull straight out. If the differential falls out you have problems as either the bearings are worn out or a bearing or race has spun. Also, although we own a case spreader I choose to use the heel bars instead for 99.9% of the axles we do here. This carrier came out with still having good preload on the bearings so those parts will be reused. Next using a slide hammer remove both outer axle bearing races. And then pull out the inner axle seal. Next I like to perform something most other shops wouldn't even think of checking and that is axle housing straightness. This is a specialty tool that most shops don't have. Since we build axle housings we have the tooling to inspect, correct or build both Dana 44 and 60 axles with either a set 10 or set 20 outer bearing. How it works is two machined aluminum pucks are inserted where the carrier bearings normally would be. A steel jig bar is then inserted through it with the bar extending beyond the end of each axle tube. Next, smaller pucks that are the same size as the axle bearing is slid over the jig bar. If the axle housing is straight the pucks will slide right in where the axle bearings normally go. This housing was bent on both sides but not enough that I felt it needed to be straightened, especially since this Scout will see little use as long as I own it. If this housing was in my tow rig or daily driver then I would proceed with straightening it. With the jig bar out of the way it was time to clean out the housing. Using a bar and a couple of balled up rags shove them through the axle tubes. Some type of cleaning agent(we use brake cleaner) sprayed ahead of time really helps with this process. Once all the way thru you'll see all the junk come out of the tubes. Repeat this process several times. Since the pinion seal was showing no signs of leakage and the pinion bearings felt good I left it alone. This is what the axle tubes looked after cleaning them out. With the tubes clean next was the inside of the housing itself. Again we like to use brake cleaner for this. Housing all cleaned out and ready for assembly. Since we were going to reuse the carrier bearings we wanted to carefully remove them from the old carrier without destroying them. For that we deployed our bearing puller. With one half of the shell removed you can see how the bearing is captured within the puller as it is readied for removal. Using a air impact gun the puller is threaded down pulling off the bearing at the same time. You can see how cleanly the bearing is removed. Note the red steel dowel atop the carrier. That is what the threaded rod is pulling against. Be sure to collect all the shims that are under each carrier bearing. It is critical that these shims not get lost and be reinstalled on the same side they come off of otherwise the gear back lash will be affected. With the bearings pressed off the ring gear is removed. Do not strike the ring gear with an ordinary hammer as you will chip the gear. We use a brass hammer for this. Once the parts are cleaned in the solvent tank they are ready to be reinstalled on the new Powr-Lok. For educational purposes the numbers on the left are the ring gears manufacturing date and the numbers on the far right represent the gear ratio. Loctite 262 red tread locker is applied to all the ring gear bolts. With the Powr-Lok in a vise all the ring gear bolts are properly torqued to 55 foot pounds. Next the carrier bearings are reinstalled. With the bearings reinstalled we use a large mallet to tap the differential assembly into place. More loctite is applied to the caps bolts. The cap bolts are reinstalled and properly torqued to 60 foot pounds. The pattern and gear back lash is rechecked. Overall the back lash changed by .001, not enough of a change to warrant removing everything again and swapping the shims around. After replacing the Dana 44 rear inner axle seal - International Scout parts The races were next installed. Upon installing them its always best to make sure they are not spinning within the tube ends. Mine were spinning. A quick fix for this is to take a punch and dimple it around the whole circumference of the housing. We apply loctite 680 retaining compound around the race before installing it. With the seals and races installed it was now time to deal with the brakes. Rags are stuffed into each end to keep dirt out of the axle housing while cleaning the brake backing plates. The brake backing plates have 6 contact points that the brake shoes ride against. These six contact points should be lightly surfaced before installing the new shoes as usually they are grooved from wear. Usually there is so much wear that the plates need to be welded back up and ground down flat. These were in relatively good condition after a mild sanding. This was the wheel cylinder from the side that looked good. It too was shot. Its always a good idea to change the wheel cylinders when performing a brake job as they really aren't all that expensive. The same swepco grease is also applied to the axle bearings. Since they were in good shape and not leaking they were reused. A bead of silicon is also applied to the seal to better assure against leakage. Next the axles are slid back into place and the four retaining bolts tightened down. The drums are then reinstalled and the shoes adjusted to the point that they slightly drag. With the rear axle and brakes dealt with it was time to move onto the suspension. The old rear leaf springs and shackles were removed along with the shackle bushing in the frame. Even though the previous owner had changed out the spring bushings I discovered that the outer shell of the original rubber spring bushing was still there and the bushings that came out had been modified. After a few minutes the old sleeve was removed. A close up shot shows the military wrap on the end of the leaf spring as well as the beefiness of the CPT shackle. Since the suspension kit comes with larger 1/2" ubolts the original rear Ubolt plates must be drilled out. I drilled them out to 9/16" so that the ubolts had a little wiggle room. On the passenger side the old original shackle bushing is removed just like the driver side one was. The same parts are installed for the passenger side. With the ubolts all tight it was time to move onto the shocks and rear brakeline. Once I'm done with the front suspension I'll come back and trim all the ubolts. A new longer CPT braided ss brake lines for Scout II's w/ 4" lift - International Scout parts Is installed in the rear. Last a set of high quality Bilstein 5100 shock - International Scout parts Are installed. Due to the design of the upper shock mount a fender washer must be used to retain the upper shock. 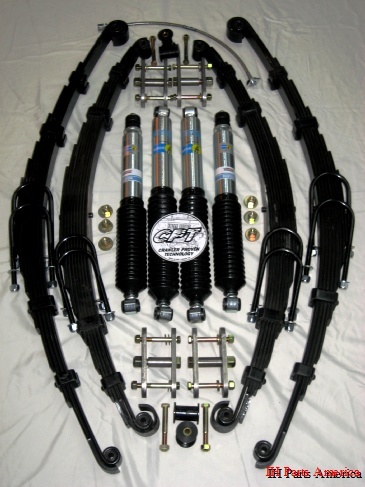 We supply these additional parts with our suspension system. And same thing with the lower shock mounts. We also supply new washers and nylock lock nuts. My driveshaft was still plenty long enough even after the new lift springs but the driveshaft itself was shot. Aside from needing new ujoints the bearing cap was spinning within the slip yoke. I had a good used driveshaft that was the proper length and installed it instead. With Stumpy back on the ground I tightened up the shackle bolts for the last time. After snapping a photo it was back up on the lift. With the front tires off I started with a basic brake inspection. These brakelines were shot. And so were the shoes. Since the brakes are still working and the plan is for a disc brake install in the future I decided to leave them alone(also it was Sunday afternoon and I didn't have the correct shoes in stock). After replacing the shackle bushings I installed both the springs and shackles. With the axle bolted in I sat the Scout back down on the shop floor with jack stands under it. As with the rear Ubolt plates the front Ubolt plates had to be drilled out in order to accommodate the larger ubolts. With the Scout level the caster was checked. Caster was sitting at positive .2* so I decided to add a 2* shim to the pack. I could have went with 4* shims but I felt this setup overall with the manual steering would steer better with the 2* shims. With the Scout back up in the air the front axle was again unbolted so that the CPT steel shims could be installed. The Scout II caster shims - International Scout parts Are designed for a 2" wide spring so they were clearanced for the narrower 1.75" springs. We will be offering 1.75" wide shims in the very near future. - edit - we now have 1.75" wide 2 degree shims in stock. I also gave the shims a slight curve before bolting them to the leaf packs as to better conform with the hanging leafspring pack. With the shims installed the axle was bolted in for the last time. Bilstein shocks and some fresh hardware was installed. With all ubolts installed and tight all were trimmed. With the axle at full droop I noticed the front driveshaft was resting against the transmission crossmember. So a little notch was removed which gave the shaft more than enough clearance without compromising the integrity of the crossmember. The front differential cover was removed for both an inspection and a new CPT aluminum differential covers - International Scout parts. Just like the rear ring gear the numbers on the front ring gear show its manufacture date and ratio. The stock front brake hoses although shot were still plenty long enough for the Scout so we replaced them with new stock rubber replacement hoses Scout 80/800 & Scout II replacement rubber brake hoses - International Scout parts We will soon offer these same hoses in stainless to match the rear. - edit - we now offer slightly longer hoses for the Scout 800 in stainless steel. While the Scout was still on the lift I wanted to check both the transmission and transfer case levels. The transmission was easy enough but the transfer case makes me wonder what IH was thinking. With suspension installed and brakes up to snuff Stumpy was ready to come off the lift. Stumpy has a nice stance now. With the Scout test driven and back on level ground the measurements were retaken and compared to side by side with the pre-lift pictures. Overall our Scout settled in at 2" of lift. With the new rear axle Powr-Lok Stumpy can now easily back up into a comfortable parking position. We had some snow recently so Stumpy was brought out as it was a great time to get some nice pictures. Check back as we continue to make repairs and upgrades to Stumpy. Very nice documentation. Looking forward to the next installment. Looking forward to following this. For perspective, what size tires are on that 800B? Tires are some half worn 30x9.50 tires. I glady take it off your hands to ease up some of the work load around the shop.